Understanding how to lunge a horse from within makes an inestimable difference to the training progress you can make with your horse. There is a lot of discussion on the subject of how to lunge a horse, and whether lunging is good or bad for horses. Some people think it is physically harmful, and others think it is boring for the horse and for them. Like everything of course, it entirely depends on what we mean by 'lunging', as the word covers a multitude of different practices. Lunging at it's best can be the perfect parallel to riding, introducing or reproducing all the same aiding systems and connections through a different medium. This depends on the technical skill of the handler to a certain extent, but above and beyond that there is a world of energetic connection which makes the idea of lunging being 'boring' incomprehensible to those who have experienced it. For the horse, correct lunging will introduce the same physical demands as the rider, but in a less direct, and therefore less intimidating way. When we train a horse to carry a rider, we have to gradually straighten out his inherent crookedness so that he can move with enough evenness to strengthen his body sufficiently to carry a rider without incurring physical damage. Lunging is the only way to begin this process and develop it to enough of an extent that when the rider gets on the horse for the first time, the new weight will be supportable without setback. 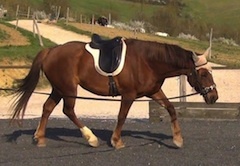 In this way, lunging is an unparalleled foot in the door, because other forms of groundwork cannot reproduce the same physical contact between horse and rider (see Dressage and Natural Horsemanship: What's the Difference for a full explanation of this), as well as the freedom for the horse to go forward without a backward emphasis, such as in long-reining. As for lungeing being monotonous and boring for a horse, 'boredom' is a human state of mind, which could also be described as a form of stress or simply the need to occupy oneself. When we feel bored it is usually related to our time-based thoughts i.e worrying about what we want to be doing, or need to do in the future. This state of mind happens when we are not accepting the present moment we are in. Horses don't think abstract thoughts like that, so for them their responses are stimulated by the situation they are currently in. It is also true that in the case of traumatized horses, they can be re-living or anticipating a past experience, but this is not a normal response for a horse, even if it is surprisingly common. Therefore, when a non-traumatized horse is moving their body and is not in physical distress, the idea that they could be bored makes no sense. Horses in the wild move over vast areas and they spend many hours doing very little. They will become hungry, frightened, angry or experience pain, but boredom is an abstract idea. Most people also would redefine their own so-called boredom, if they analyzed it properly and brought themselves back to the source rather than living in their thoughts. What we define as boredom in horses is in fact very often dissociation from their surroundings due to stress and depression. Horses do not need to occupy themselves permanently to be happy, but they do need a certain level of freedom and social interaction for their mental and emotional health. Horses kept in solitary confinement in stables may seem bored to us, but it is actually the security of the herd that they are missing not some other kind of stimulation. That said, there is the danger of horses going into 'autopilot' when being lunged. This is not a state of boredom, but a reaction to distress. It is a horse's way of escaping a difficult situation: they dissociate their consciousness from their body, a bit like going into a trance. Traumatised horses do this very easily when 'triggers' which have occurred in the past as heralds of unpleasant situations reappear. When you learn how to lunge a horse from within, you will be much more aware of these states in your horse, and what is causing them. 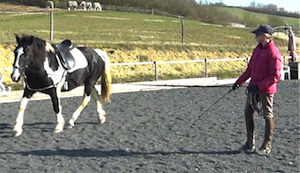 lunging with tight side reins/gadgets and the horse begins to suffer pain in the neck and back (photo, right). lungeing without attentiveness yourself can induce a state of oblivion in the horse which mirrors your state of mind. It could be described as human-imposed boredom, although in the horse it is more like an emptiness than a reactive state. Another important issue which comes up when considering how to lunge a horse correctly is the 'forwardness' question. It is certainly very important to develop the ability to gauge the energy a horse is putting into their work. Without a certain level of motivation happening, the horse won't develop enough muscular tone - in particular postural muscle - and the necessary central nervous system programming, to continue to improve. Correct work ultimately requires the maximum effort possible from horse and rider. The important distinction to make here, however, is that although the fast-twitch muscles and the cardiovascular system are important to a certain degree, true fitness for dressage depends on the efficiency of the postural ring i.e. the strength of the postural musculature, as well as the suppleness of joints and tone of the supporting ligaments. A horse will never strengthen the ring of engagement simply by charging forward. A dressage horse is not a racehorse or an endurance horse, both of which need energy to funnel straight into forward movement. When a dressage horse can inject maximum energy into their movement, it is because they can control it and channel it into a different expression of movement, which is less straightforward. It is very important when learning how to lunge a horse towards this end that forwardness is only injected into controlled movement. This means the horse must develop enough balancing capacity first, and the energy is only introduced gradually as the horse can process it through the postural conversion. If the horse loses rhythm and balance then the forward energy has to be diminished again, until the right form is reestablished. Lunging horses as a form of exercise to let them vent tension means that their lifestyle is not doing them any favors, as well as the fact that they will associate lunging with being tense. 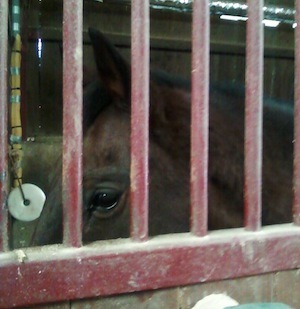 Solitary confinement in stables is not healthy either physically or mentally for any horse, and training will always be compromised by this form of management. If you need to lunge your horse before riding in order to feel safe getting on him/her, then there are almost certainly tension issues present that need to be addressed via the lifestyle and management, so that training can be built on the foundation of relaxation that is necessary for all correct work. Learning how to lunge a horse from within is a case of putting the spotlight back on ourselves. This is similar to riding, where it is easy to focus only on how the horse is going, instead of concentrating on the influence of our own posture. After all, everything we will ever achieve on a horse can only be as a result of our own physical and psychological state. We influence the horse through ourselves, and losing sight of that, or never even realizing it, will always make our achievement one dimensional and unsatisfying. Understanding how to lunge a horse through ourselves, starts with our own posture, but there is a lot more to it than that. Once our posture and technique is established enough, there is a whole world of communication we can access from the power of thought and other ways of using energy. We are amateurs in this area compared to horses, they enjoy it and it also cements our trust bond with them because they appreciate being acknowledged so deeply. The basic framework of lunging in the 'energy' way is to communicate to horses how to carry themselves. This particular carriage is not natural to a horse, and is a way of moving we have to train a horse to be able to accomplish. We have to protect the horse's trust in our demands, by introducing this new postural dynamic with sensitivity and patience. Each horse has a different tolerance level, both physical and mental, and pushing through those with force will only generate physical restriction/stiffness patterns through the horse's body, and psychological barriers when the horse either dissociates from us or refuses to work with us. Knowing how to lunge a horse from within is the perfect way to stay aware of the tolerance levels of a horse because we are connecting with the horse from the part of ourselves which accesses our intuition and innate wisdom most clearly. This is because putting our attention into our own state of body and mind brings us into the present moment, and it is in the present that we can know the truth. Being preoccupied with other things while working your horse. If your mental focus is elsewhere when you are lunging, then the quality of awareness that allows you to pick up on how your horse is feeling will be compromised, as well as your sensitivity in following the process of straightening and balancing him. Having goals and ambitions for your horse which are based on external factors, such as competitions or how quickly you think your horse - or yourself - should be progressing, is one of the most powerful negative forces against reaching that place in your mind where you accept that anything is possible. This is because when your mind is taken up with thoughts which come from elsewhere, how can you possible see what is actually happening with your horse? Maybe you read a magazine which says horses do X at this age and Y at another, when you look at your horse, you will only be making comparisons rather than engaging yourself with the reality, and it is only when you do engage with what is there that you can make real progress. Taking the behavior and capacity of your horse personally is another trap which can keep us out of the present moment. In our experience, which comes from working often with horses without much reason to show generosity to humans, we have come to understand that all horses are being exactly who they are in any moment. This then means firstly that they are honest, and secondly that they don't try to evade our wishes in any deliberate way. They simply don't think about things in that way. If they can comply with our demands, they will, and of not they will let us know. It is up to us to observe their reactions and find the best balance between what we would like them to do and what they give us. Horses are like people in that they are all individuals, and some know their limits better than others, if we can access it in ourselves, our intuition will tell us how far we can push. Letting our ego get in the way because we get disappointed, angry or aggrieved, will blind us to the truth. Horses are never judging us or trying to get back at us (only in a humorous way sometimes!) they are marvelously generous, and the more we believe that, the more we will be privileged to see of the world of their pain, suffering, joys and understanding. All of the above examples can be described as letting fear get in the way. It is always fear which is the enemy of truth. Worrying that we aren't good enough, our horse isn't good enough, other things aren't how we want them or fear of being injured by our horse or when we ride. Fear has to be acknowledged and allowed for it to resolve. It is part of who we are, and identifying it when it is manifesting itself is the key to letting it go. Learning how to lunge a horse from within is a great opportunity to address these issues in ourselves, so that they don't distort the path we take with our horse. The main tools you have when lunging in this way are the power of your mind and your central nervous system. 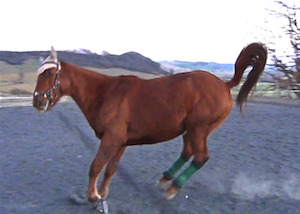 You are attempting to reach your horse from a physical distance, which in this context can be seen as an advantage over riding because there is less chance of confusing your connection with aiding you aren't aware that your making, or attempts to regain control or force the connection with your body. It is also easier to respect your horse's boundary when you are a distance away. When you have successfully established a gentle, consistent contact between you and your horse through the lunge line (for more information on how to achieve this look at Lunging A Horse Well) then the first step is to tune into the level of activity your horse is expressing. Activity, or forward movement, is like your gas when you are cooking. Without any gas, nothing is going to cook, but too much and your food much going to burn or boil over. At the beginning of the session you don't want to have so much activity that your horse's joints don't have a chance to loosen off, and you don't want your horse to go beyond your influence by rushing or losing balance. For these reasons it is important to start off very gently and feed the energy in slowly, like turning on a tap carefully so you don't spill the water. To understand how to lunge a horse from within, you have to be aware that you can only influence the horse through acknowledging how the horse already is. Go back a step in your mind, and instead of instantly trying to change the dynamic, instead let the dynamic clarify itself to you. The joy of horses is that this dynamic is always unique for that horse, on that day in that moment, that you are together. As soon as you are able to perceive to some degree the picture your horse is presenting, then the space has already been created for change. The change is probably happening at that very moment. Become aware of which parts of the horses body catch your eye. This usually happens because these places have physical restrictions which are blocking the flow of energy. Once your eye is caught by these places - which attract attention because they are like energetic black holes - let your gaze rest there softly and your focus will bring the healing intelligence of your horse's body to that area. We have noticed that horses often bite and kick each other in these blocking places to stir up the same awareness, but it does not need to be so physical, in fact the softer your approach, the more power it has. Allow the balance of the horse's movement to come to you, as if it were waves washing over you. If you practice this you will be able to feel the natural carriage of your horse, whether the horse tends to run down into the ground, or hold themselves hollow, or balance easily. Once you have some sense of the way your horse stabilizes their body, then imagine that at the same time as letting the present dynamic flow in your mind, you can gradually divert it towards the balance necessary for the horse to carry a rider well. This is how to lunge a horse in a way that genuinely prepares the horse for ridden work. So if your horse is bending to the outside, you allow that to flow, but at the same time imagine gently diverting the bend the other way, in other words you resonate with the horse bending around the circle not against it. You do this through knowing what it feels like in your central nervous system to bend round the circle. Become your horse in your mind and really feel it how you wish him to move. Another good starting point for learning how to lunge a horse from within is to look at the quality of your horse's movement. Is the walk tense or flat? Is the trot short or stiff? Or are the transitions always hollow or jerky? Once you can describe the movement in some way, with textures or descriptive words or even colours, then sense in yourself how you would move differently if you were the horse. Feel how you would soften your stride, or take a bigger swing or slow down and carry your weight differently. Another focus could be the way the horse stretches their top-line, whether they always snuffle along the ground with their nose, or maybe go hollow dropping their back and sticking their head up (top photo above). Once you can see the way they move, whether it is natural, or has been formed by the way they have been ridden/trained, you can influence it by feeling that perfect parabola (bottom photo above) in your body & mind. When learning how to lunge a horse in this way, keep your mind relaxed and always return to the whole picture. Keeping your focus between trying too hard and distraction is difficult at first and you have to appreciate each little sign of progress. Everyone has the ability to develop these senses in themselves, and each person can have particular talents, but it requires a bit of faith and patience. 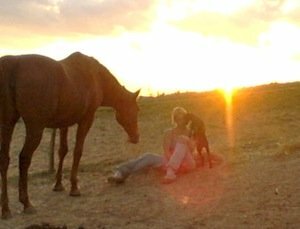 It can be amazing how quickly the horses will respond and connect to your energy, they are always the best teachers. Never underestimate the transformation which is possible in a horse, your belief is your only limit. The most awkward horses can become elegant, and the most apparently stubborn horses can become highly sensitive. The key is to allow the space for change. These pictures show the difference that sensitive lunging has made to Jasmine - a horse with spinal problems to to malnutrition during her development. These difficulties meant that lunging with a strong mental awareness of what was going on in her body was abslutely essential, and discovering this realm became a wonderful journey for her owner too. The second picture shows the postural stength Jasmine has acquired as a result of her learning how to lunge a horse from within. If you would like a full guide to how to handle and lunge a horse in this way, Camille Dareau's eBook How To Train A Horse Without Force is a unique and in-depth description of these methods, covering all dimensions of training: practical, gymnsatic and energetic.